Many people trying to become a UK firefighter spend years looking and applying for jobs in the UK fire and Rescue service. 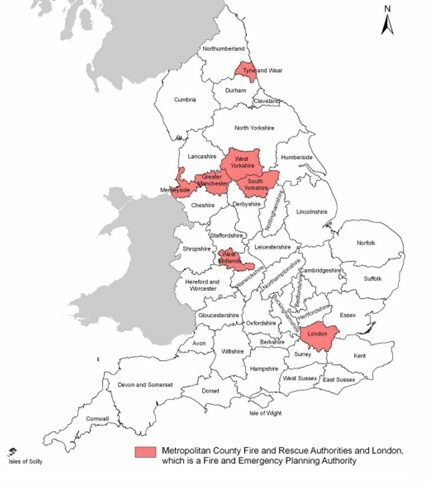 In the UK there are over 60,000 Fire and Rescue Authority personnel. In England alone there are nearly 30,000 wholetime firefighters. In the UK each brigade or fire service will advertise their own jobs and each have their own entry requirements. It is important that you check with the brigade you apply for to find out what the entry requirements are. To obtain these details, contact the Chief Fire Officer at that particular fire service. Jobs for the Fire and Rescue Service are posted across the 46 different fire service (brigade) websites. Emergency Services Work – Putting out fires, rescuing victims from accidents, dealing with hazardous spills etc. Fire Prevention Work – Conducting fire safety awareness presentations at schools, inspecting buildings etc. Routine Station Duties – Maintaining equipment and training etc. Tens of Thousands of people apply each year to Fire and Rescue Service jobs each year and it is estimated that more than 75% of those applicants never make it past the initial application stage. It is important to consider that although the statistics seem against you don’t be put off as the candidates that fail are often highly unprepared and fail to apply for jobs as soon as they are available – put yourself above other candidates. When applying to become a UK firefighter it you will need to contact each fire service’s Chief Fire Officer or recruitment officer individually to for details of that brigade’s selection process and job requirements. As part of your firefighter application process you will have to undergo and pass physical and medical tests so it is important you are in good health and fitness. You will also have to pass written tests and an interview. Many colleges throughout the United Kingdom work in collaboration with fire services and offer pre-recruitment courses that will help your preparation, knowledge and skills for the role of a firefighter and the selection process. An alternative way of entering the UK Fire and Rescue Service is to become a volunteer. Volunteer roles often consist of jobs support the active firefighters such as being a control room operator. Voluntary roles in the fire service often provide a good insight to what it is like to work as a firefighter. Finding volunteer, Wholetime and Retained duty system (RDS) firefighter jobs requires constant monitoring of each individual fire service website. It is important to apply to a position as soon as it becomes available due to the increasing competition. Recruitment campaigns aren’t frequent – don’t miss them! WHY CHOOSE OUR JOB ALERT SERVICE? Instant notification – you will be alerted as soon as a new WHOLETIME position becomes available via email. Direct link the application form – We will send you a link to apply straight away. Stress and hassle free – we do all the work! Our aim is to provide you with the application from before anyone else so that you significantly increase your chances of becoming a firefighter. How2become’s email alert service costs only £2.95 per month. Or you can sign up for the year for just £30. Consider how much it would mean to you to get your dream, and for just £2.95 per month you can get guaranteed alerts for when your local fire service is recruiting for wholetime vaccancies. Is it worth £30 for a year to ensure you get hold of an application to take you one step closer to becoming a firefighter?